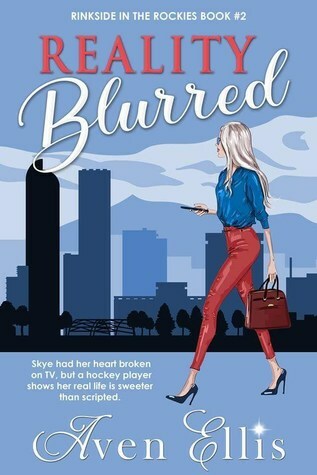 Aven Ellis’s newest novel brings readers back to the Rockies with Reality Blurred! We’re introduced again to Denver Mountain Lions hot Belgian Maxime, and America’s Sweetheart Skye in a fun twist to Ellis’s usual hockey romances! Skye was on the TV show “Is it Love” where the whole world saw her have her heart broken. I loved the reality show aspect to this novel! Skye is outgoing and of course has the paparazzi always trying to sneak a picture at her worst while she’s trying to get over the humiliation from the show. She’s bubbly and fun, and determined to prove she’s more than a failed reality star. Maxime is more reserved and hates being in the spotlight even though he’s a successful hockey player. Maxime is such a sweetheart, especially when he would speak in French to Skye! I truly loved seeing their relationship develop. Maxime saw Skye in Brussels at her lowest right after “Is it Love” and felt he missed out on an opportunity to get to know her, but they both have baggage from failed relationships that bring a lot of pain and hurt into their lives! But can two opposites come together over a love for chocolate sprinkles, put their past hurts behind them, and find love again in the Rockies? If you’re looking for a sweet, funny, romantic read, definitely check this one out when it releases tomorrow, February 14! It will be the perfect Valentine’s Day read! While this is book two, you can start with this one and go back to the first one, Sugar and Ice! I received an ARC from the author to read and review! All opinions are my own. Thank you, Aven! Pre-order before tomorrow on Amazon! Read my review of book one, Sugar and Ice!